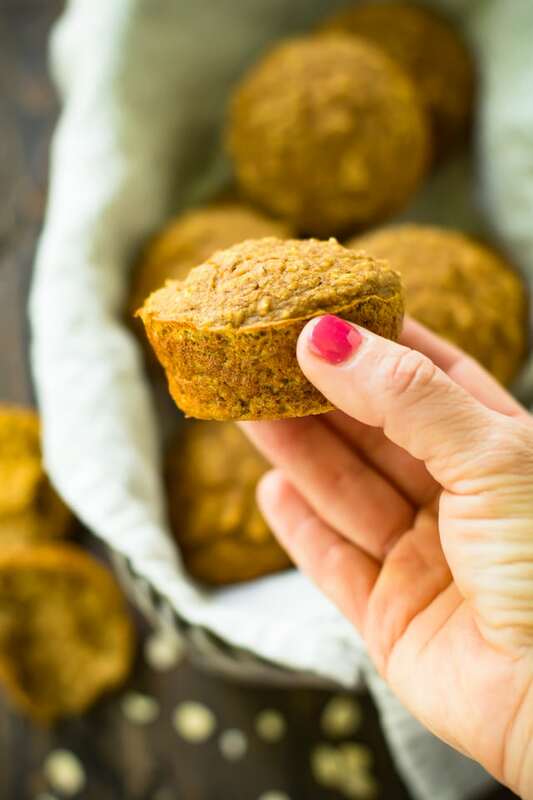 Moist and packed with fall flavor and the perfect amount of spice, these Pumpkin Protein Muffins are so delicious that I can guarantee no one will ever know that they’re loaded with protein and healthy carbs, and that they are low in sugar! With this winning combination of flavor and nutrition, they are sure to be a hit this fall season! Wowee. Fall is just around the corner, you guys. And if there’s one thing I love about this time of year, it’s that my body begins craving slightly heartier, soul-warming foods. You know like muffins! Pumpkin muffins! I always try to keep things a little on the lighter side, though. So, my pumpkin muffins have a few healthy twists. 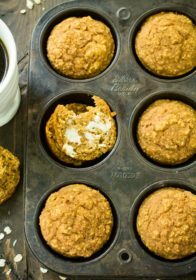 This pumpkin muffin recipe uses oats, pumpkin (duh), and So Delicious Dairy Free CoconutMilk Yogurt Alternative, making them the perfect healthy fall treat. They’re even gluten and dairy-free, so everyone can enjoy! Whether I’m baking with yogurt, using it as a topping for pancakes, waffles or granola or just straight up snacking on it. So Delicious is my go-to. 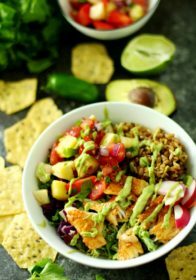 So Delicious uses organic ingredients whenever possible and their entire line of foods and beverages is certified vegan and Non-GMO Project Verified or enrolled. They also don’t use artificial flavors, colors, hydrogenated oils or trans-fats. Because all of their foods and beverages are plant based, the whole line is also cholesterol free. It’s a product I feel so good about enjoying and also feeding my family! 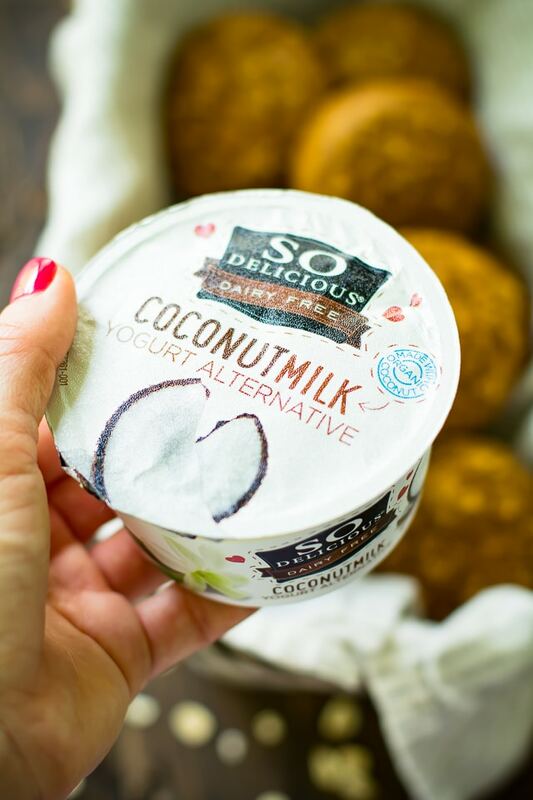 So Delicious offers an array of tasty dairy-free delights to sip, bite, pour, scoop, lick and chug throughout your day. Yes, the coconutmilk yogurt alternative is great, but have you tried their dairy free frozen desserts? Oh my goodness… to die for! Let’s get to baking! 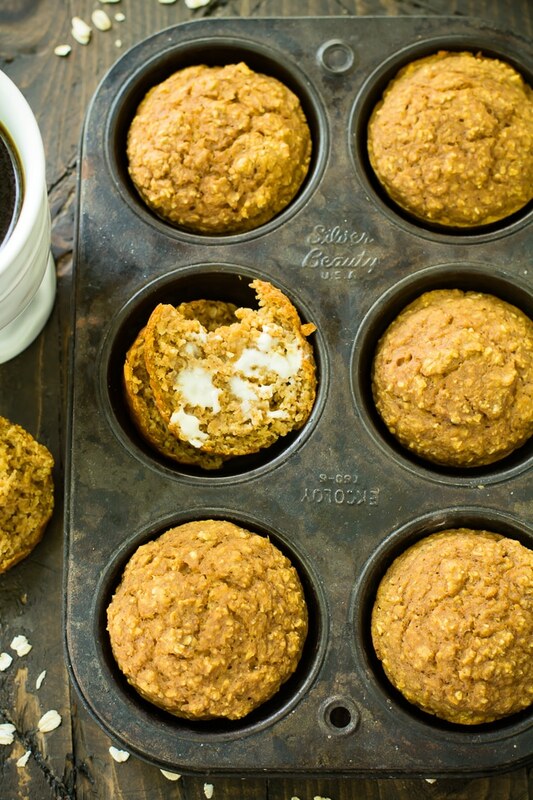 This muffin recipe requires just a blender (OR food processor OR bowl) and about 30 minutes. The ingredient list is also really simple and clean. 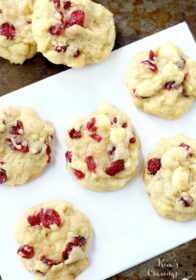 You can get fancy and add-in things like mini chocolate chips, nuts, and/or dried fruit. But these are so stinkin’ delicious that there’s really no need. My kiddos didn’t even need chocolate chips to gobble these babies down! Aside from being irresistibly scrumptious, you’ll also find that they’re UBER moist; as in uber. Some might even be like, “Wow, that’s a moist muffin.” But is that such a bad thing? I will say, however, if you prefer a more crumbly muffin, simply add in a touch more flour and/or a handful of oats to absorb more of the moisture from the yogurt, applesauce and pumpkin. These would make the perfect take-along snack for work or school. They would also make a lovely holiday gift or dessert for fall parties. And since they’re refined sugar-free, gluten free, and dairy free, everyone can enjoy. If you give this recipe a try, let us know! Leave a comment and take a picture and tag it #kimscravings on Instagram! I’d love to see your version. Enjoy, friends! Preheat oven to 350 degrees. Line a 12-cup muffin pan with foil cupcake liners, or spray with non-stick cooking spray. Set aside. Divide mixture among muffins tins, and place into pre-heated oven. Bake for 15-20 minutes, or until tops are lightly golden brown. Note this batter is very moist, and a toothpick may not come out clean…Don’t worry it is baked through if the tops are golden brown! *I used Stevia in the Raw Baking Blend. If using packets of stevia, I recommend using about 5, or adjust according to taste. **If using carton egg whites this will be 6 tablespoons. ***Nutritional info calculated without add-ins, using IdealLean Multi-Purpose Protein. 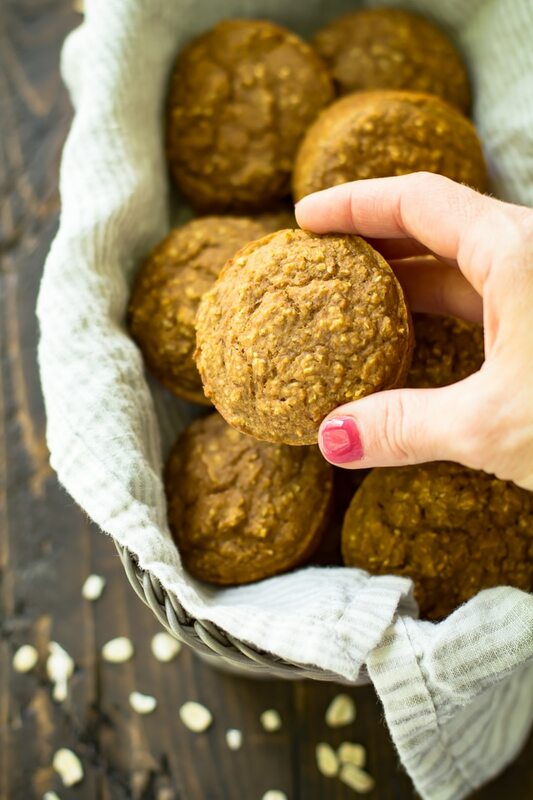 Love these Pumpkin Protein Muffins? You’ll want to try my other fall favorites! 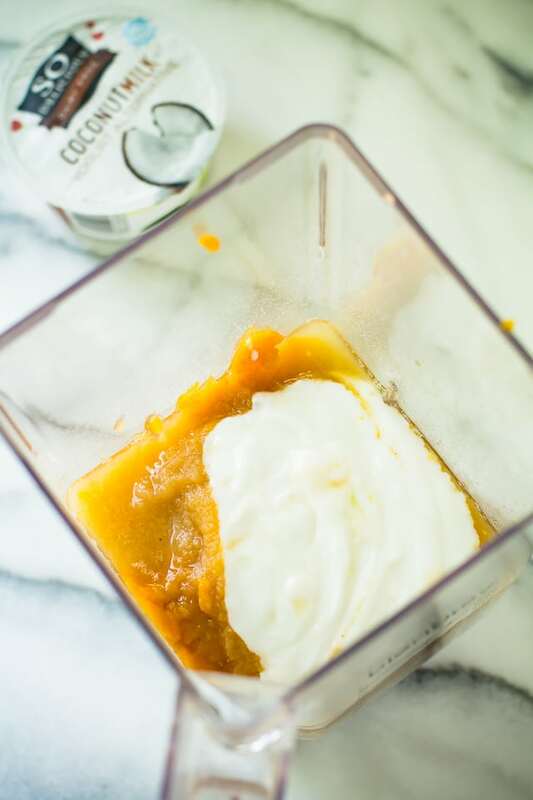 Have you made anything pumpkin flavored yet? Have you tried any of So Delicious Dairy Free products? What are you waiting for?! Grab this coupon and give So Delicious a try! This post was sponsored by So Delicious Dairy Free. As always, all thoughts and opinions are my own. 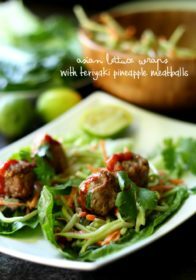 Oh my goodness this sounds absolutely delicious – I love that they are full of protein and gluten free. 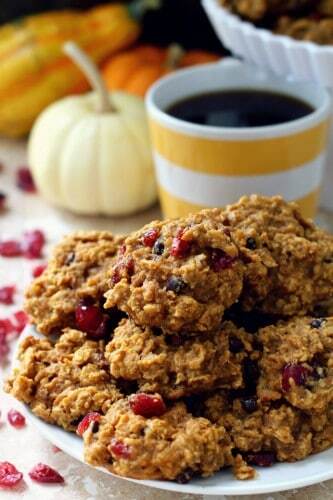 These sound like the perfect snack for fall. I love pumpkin flavoured baked goods and it’s great that these are low in sugar! 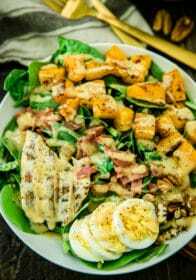 Wow this looks and sounds so healthy and delish. Making me really hungry. 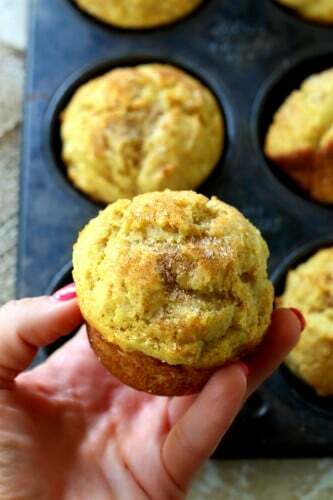 I’m definitely a muffin girl and this one may be next on my “to do” list! I usually go for the blueberry, but a nice protein muffin for breakfast may not be a bad idea at all. We’ll see what happens. Always great to have healthy alternatives. I LOVE these! A pumpkin treat that I don’t even have to tell myself is a treat. These look like pure perfection! looks absolutely delicious!! Bookmarking this post for future!! I just saw these on pinterest and popped righ over becuase they sound so good! and look delish!!! What would I use to replace the protein powder? Ground oats or ground nuts, maybe? These look delicious – but I really get enough protein. Thanks! 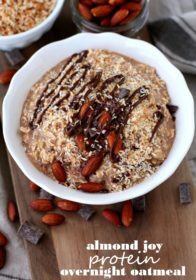 Yes, just add another 1/4 cup of oats. Enjoy! 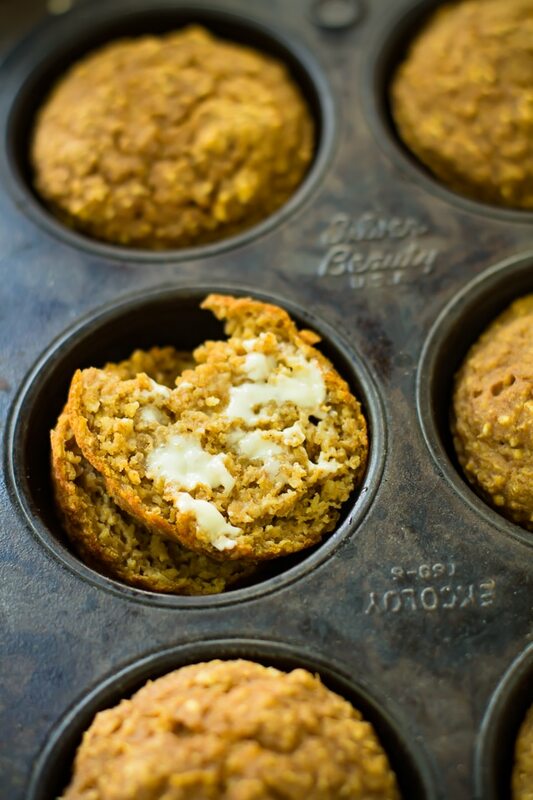 Yummy I love pumpkin muffins, I will be sure to give these a try and make them soon! Send me all the pumpkin treats! I love this time of year. 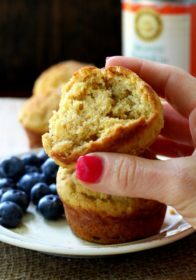 These protein muffins give me the flavor I love with the protein I know I need! That’s awesome!! I’m so glad that you loved them! 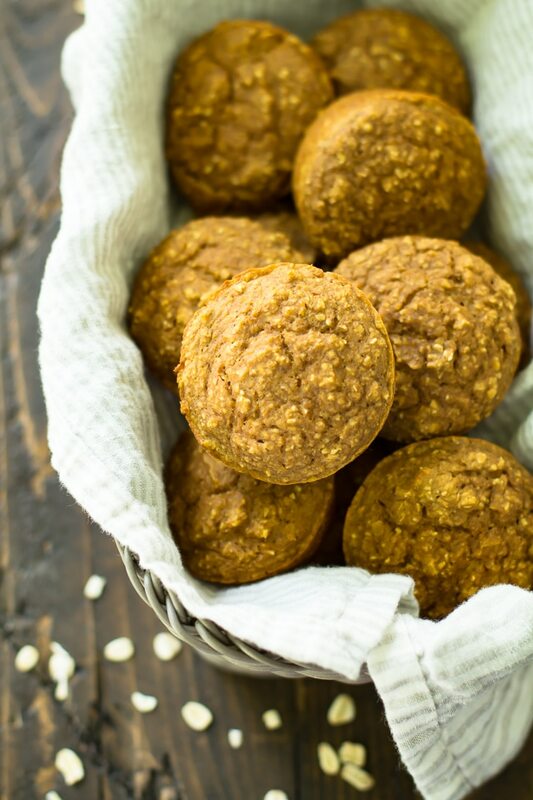 This recipe for the pumpkin protein muffins sound so good. 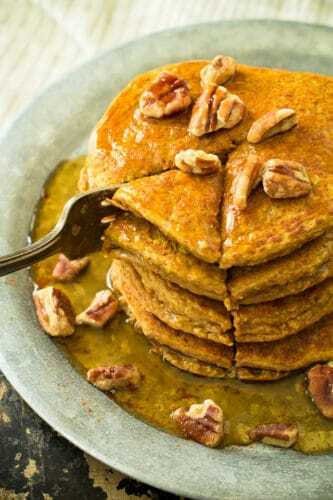 It is the perfect time of year to make pumpkin recipes and these sound like they would make for a great breakfast food for on the go. 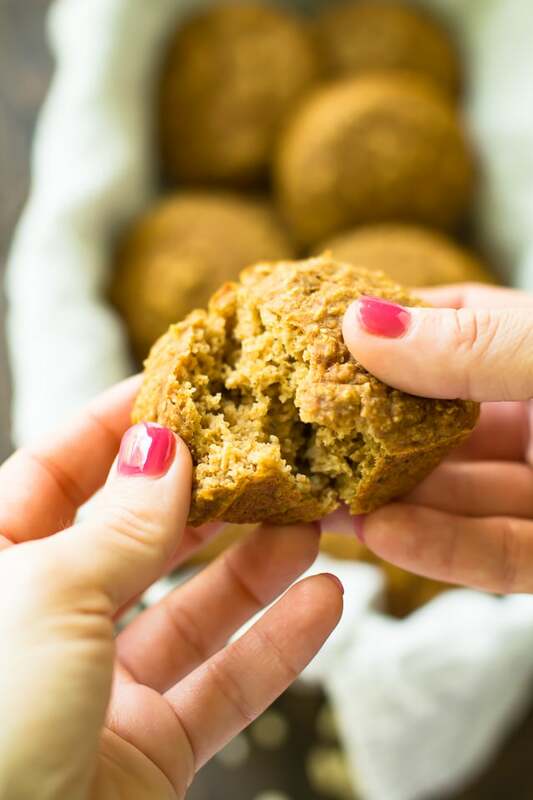 Thanks for sharing the recipe and I am going to have to try the gluten free pumpkin banana muffins too. Made these today and they are delicious!! I followed the recipe the only thing I did differently was cook them for the full 20 minutes maybe even a couple minutes more but they came out so moist. I used and protein powder specifically for baking and am so excited I now have a recipe to use for it. So, so glad you enjoyed and thanks so much for taking the time to comment! !